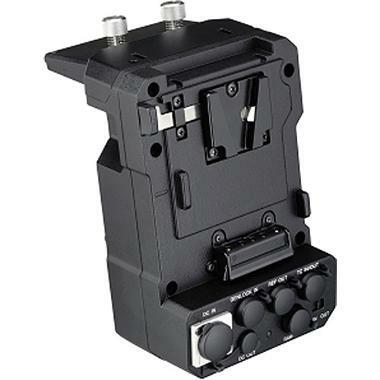 The Sony XDCA-FS7 Extension Unit for PXW-FS7 attaches to the back of the Sony PXW-FS7 XDCAM Super 35 Camera System. It enables RAW data output for recording 12-bit 4K/2K RAW footage to external recorders. It also has built-in ProRes encoding for writing 1080p ProRes 422 footage to an XQD card in-camera. It is equipped with V-Mount (as well as an adapter Gold Mount plate) and provides an easy way to add V-Mount or Gold Mount broadcast batteries (not included) to your FS7. The MultiPin connector on this unit allows for cable-free attachment to the camera. This unit is essential for those seeking RAW out to external recorders and internal ProRes shooting with their FS7s and/or those seeking Timecode and Genlock connectors for multi-camera operation. • You won't be able to mount this extension unit to your FS7 with a BP-U60 battery inside. Remove the battery before attaching the unit. • This unit has its own fan. It isn't loud but may influence whether or not you want to use it.